There is now a growing network of S-100 bus computer collectors. 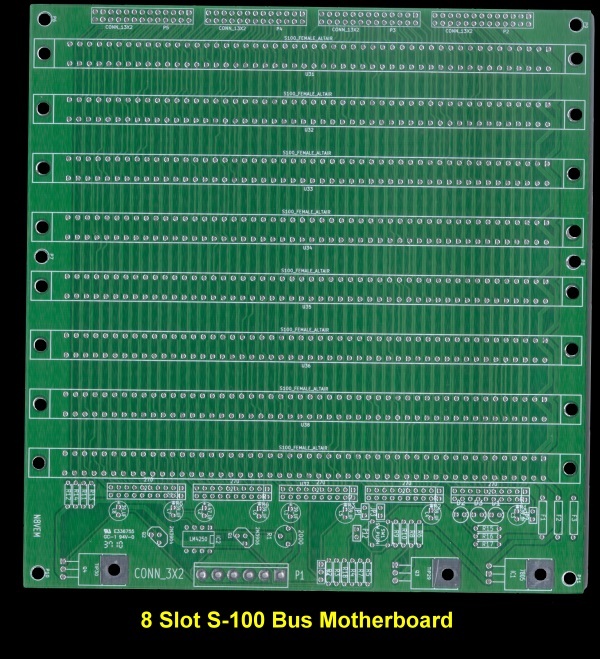 If you have a newly designed S100 bus board for sale please let me know I will add it to a list on this page (see below) for free. Please include a description of the board, asking price, phone number if required and an e-mail address. As you can see in other sections of this site I and a handful of others continue to make custom S-100 boards for our own use. A lot of work goes into designing and manufacturing these boards. Typically they start off as a point to point wire (or wire wrapped) soldered prototype board. Then a long process at arriving at an efficient schematic is carried out. 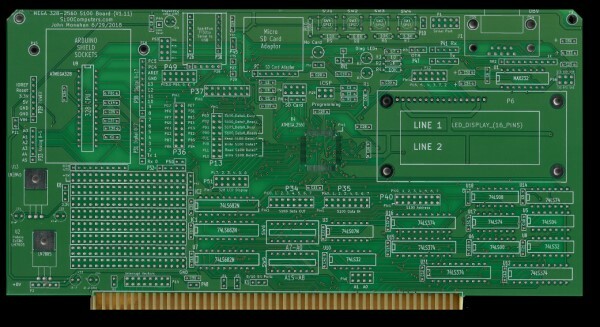 A first prototype board is then manufactured. The process may have to be repeated before a final commercial quality board is made. Realizing a number of others may want to use these boards we typically open the final "commercial" board to others that may wish to obtain them. 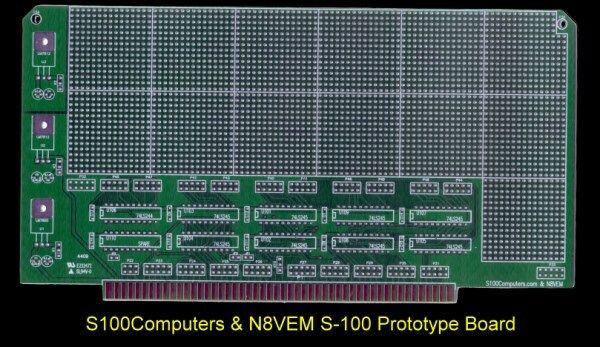 These are high commercial quality but bare S-100 boards. You have to add your own IC sockets chips etc. A schematic and assembly instructions is provided for each board however on this web site. 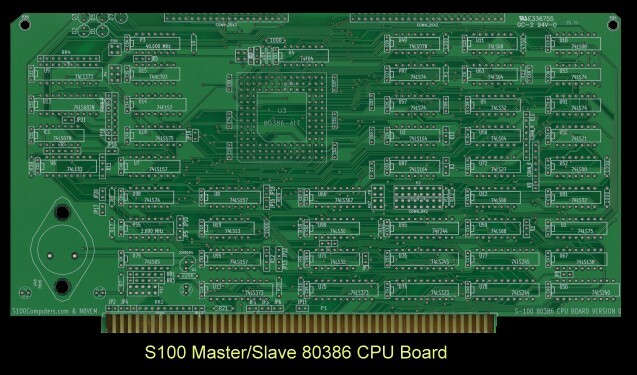 For more information about ordering S100Computers boards please see here. Please remember however this is NOT a commercial venture. 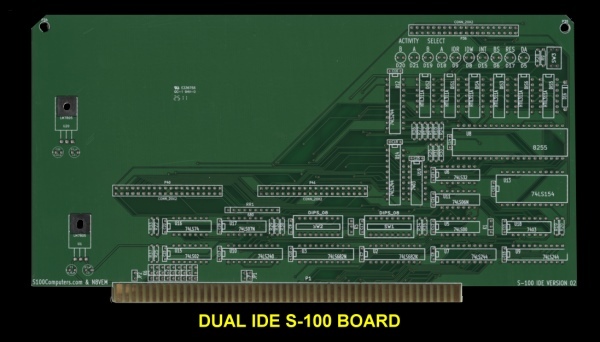 This is a fairly old S-100 Prototype Board that is designed to help take away the initial drudgery of building S-100 prototype boards. We have laid out the board so all the address and data lines are buffered through 74LS245's or 74LS244's. Most of the common S-100 bus control and status signals are also buffered. So the user can right away get down to building useful circuits without the bus connection/IC overhead. Also the board is arranged so a daughter piggyback (no S-100) board can be attached via a series of connectors. This way you can have cheap simple test boards made before you "burn" your own real (more expensive) S-100 board. If you have a real interest in a board(s) let us know. Note these are bare boards. You add chips and other components yourself. There is a wait list for additional boards if and when demand warrants. A second improved version of this board has been made. 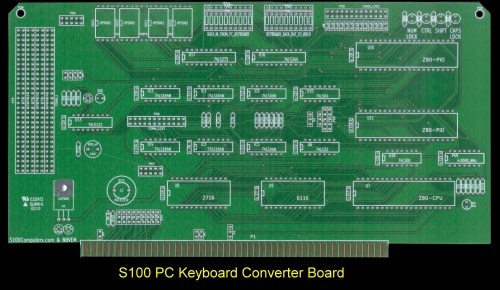 This a basic S-100 prototyping board (no buffers etc.) has a 9"x4.5" area of PTH for wire wrap or point to point wiring of prototypes. All pins are exported and includes circuitry for three voltage regulators, +5V, +12V, and -12V. The SCRs are optional and can be modified by the builder as desired. 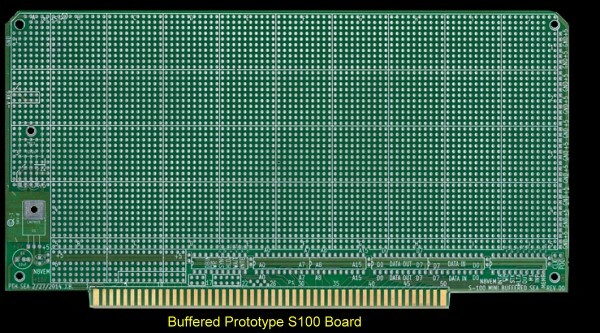 The S-100 prototyping boards are $25 each plus $3 shipping in the US. 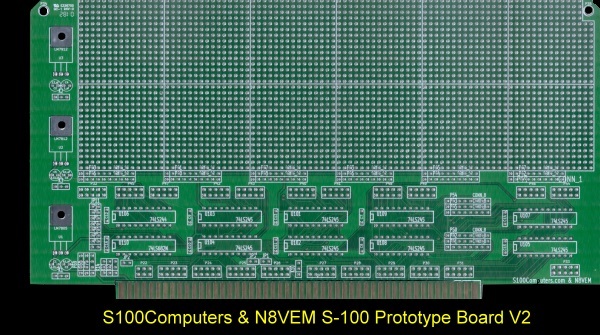 These S-100 prototype board PCBs are currently all sold and in the hands of builders being tested and used. 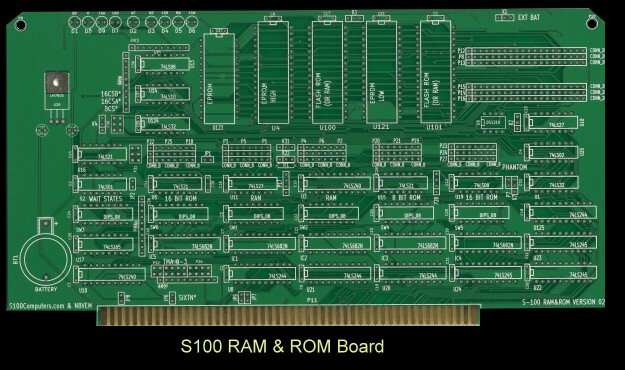 The S-100 backplane is an 8 slot active terminated motherboard for building and/or repairing small S-100 systems. It is primarily intended for bench-top work to repair and/or build boards without risking a valuable legacy S-100 chassis. Please see here for more information about this board. I completed a third edition of this S-100 IDE Board that is designed to interface the S-100 bus with two IDE drives and/or Compact Flash memory boards. 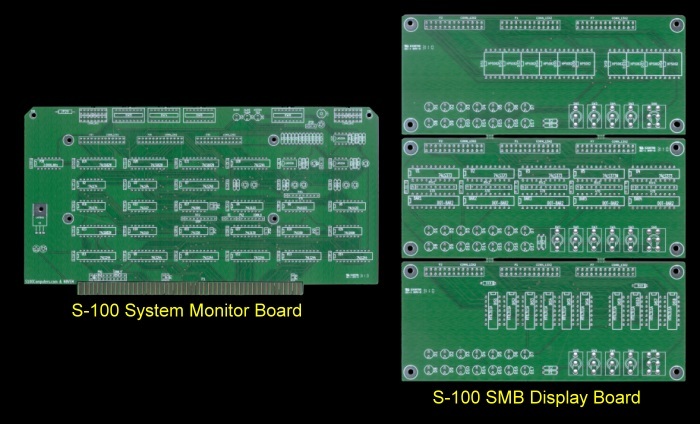 The third batch of boards have been used up by S-100 users. There is a wait list for additional boards if and when demand warrants. Please see here for more information about this board. 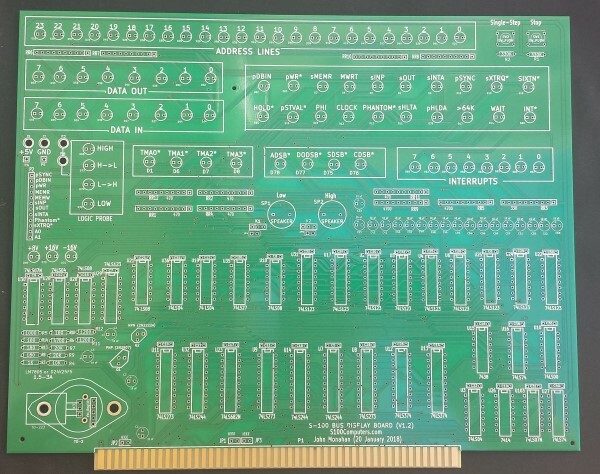 This board allows you to utilize a standard modern day PC keyboard as an ASCII keyboard for S-100 bus systems. 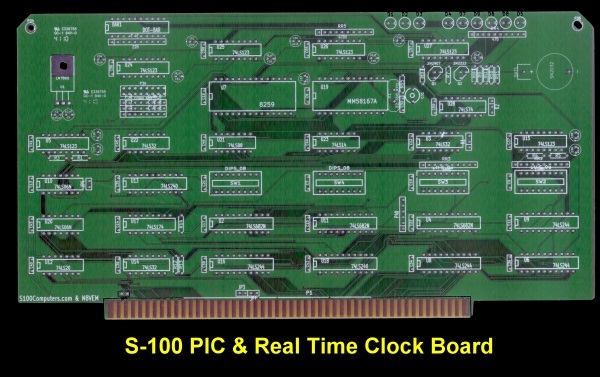 A second batch of boards have been used up by S-100 users. There is a wait list for additional boards if and when demand warrants. 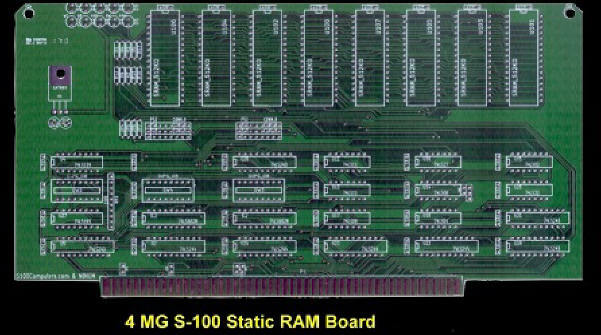 This is a 4 MB S-100 Static RAM Board that is designed to allow you to utilize any speed CPU (8 or 16 bit) in the S100 bus up to its maximum capacity of 16 MB. 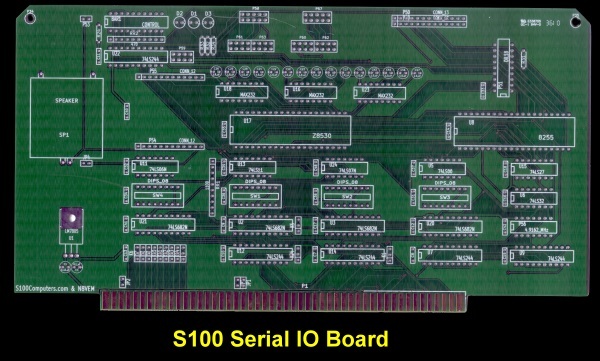 A batch of boards have been already been used up by S-100 users. There is a wait list for additional boards if and when demand warrants. 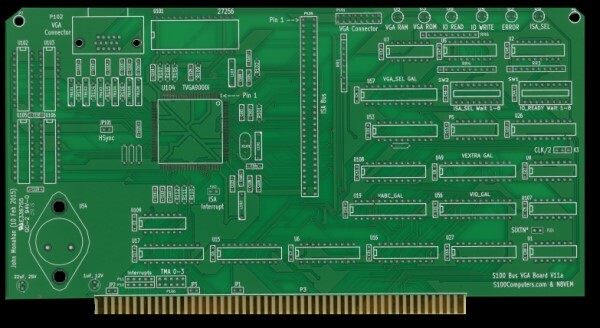 This is an S-100 Board that allows you to review important S-100 bus signals and control the Master CPU running the bus. Information about this board can be seen here. 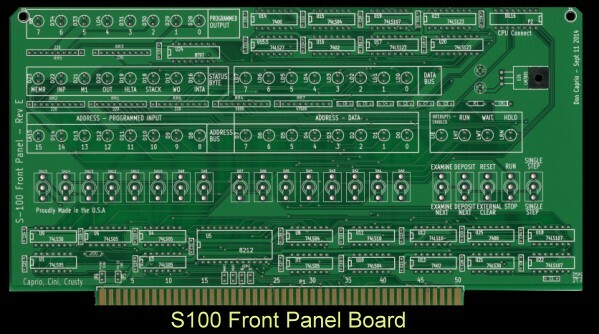 The board comes as a main S-100 board and one of three different types of display boards. You cut and add the type of display board you need. 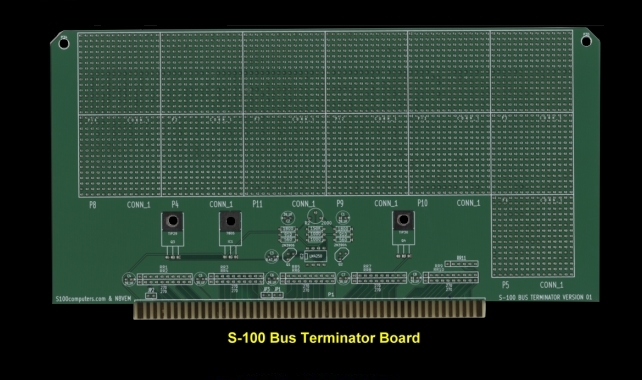 This board allows you extend the S-100 Bus up above other boards in the bus so you can review and debug a board. This is an essential board for any kind of serious hardware debugging. 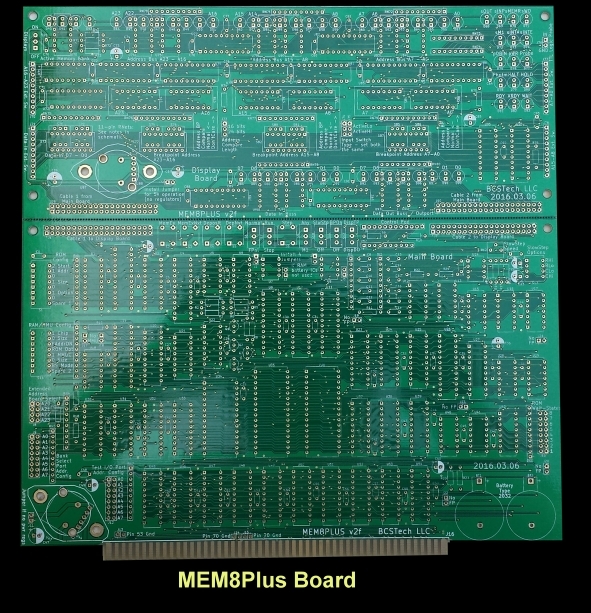 This board allows you to utilize a wide verity or EPROMS, EEPROMS, Static RAM or Flash RAM chips in an S-100 system. A Speech Synthesizer and USB Port in an S-100 system. This board allows you to put a MM58167A Real Time Clock chip and an 8 and 16 bit Priority Interrupt controller (an Intel 8259A) on the S-100 Bus. 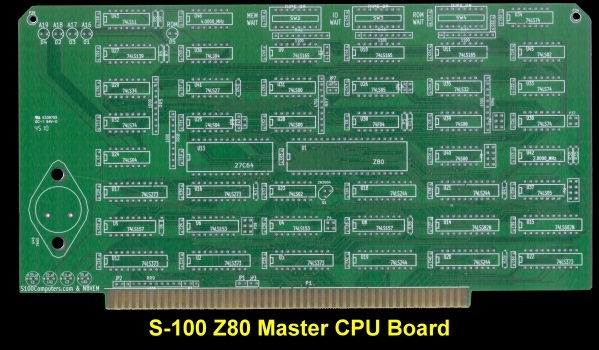 This board allows you to put a Z80 CPU on the bus as an S-100 Bus Master. 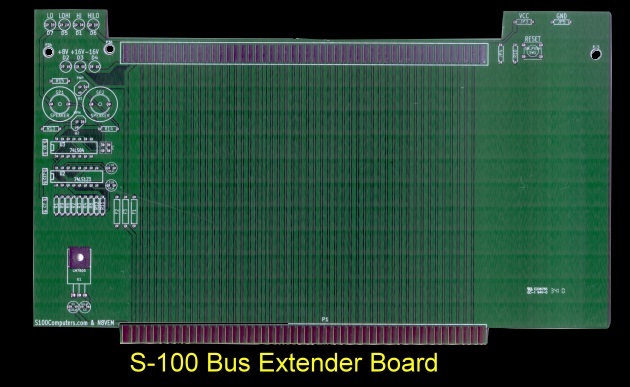 In an active terminated S-100 bus the board is capable of reaching speeds of 10MHz. 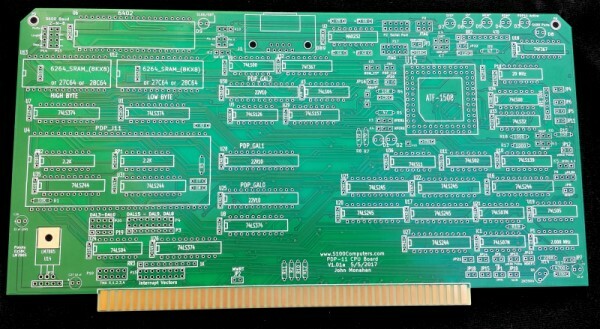 This board is a general purpose Z80 CPU driven Floppy disk controller board for 8"and 5" floppy disk drives. 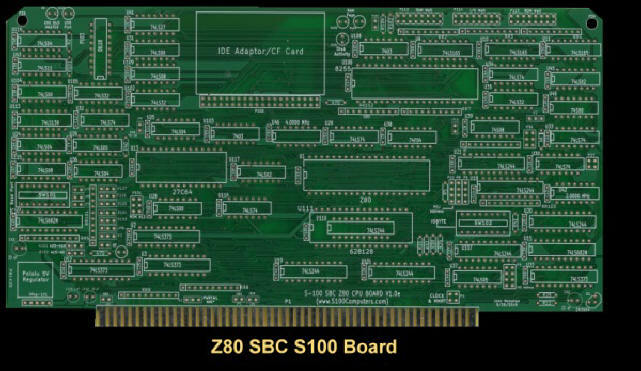 This board is a general purpose S-100 Console-IO board Z80 CPU. It utilizes a standard IBM-PC keyboard as input and outputs data to any VGA compatible display. 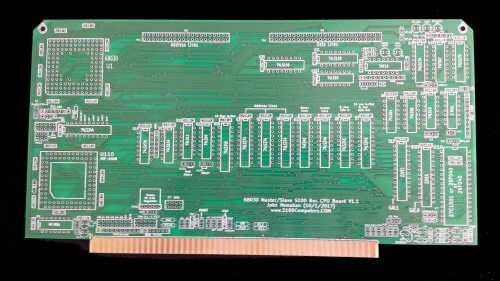 This board is a general purpose S-100 8086 CPU Board. 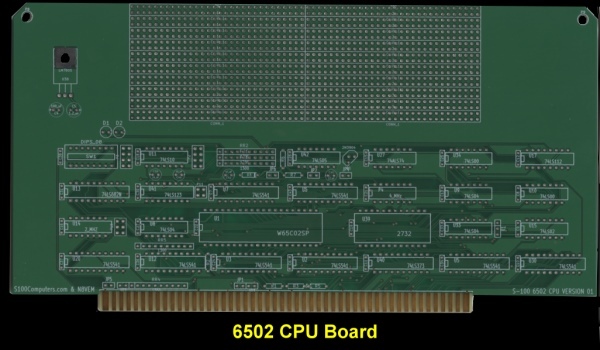 It is utilizes with other boards on the S-100 Bus to run CPM86+ or Microsoft 's MS-DOS. 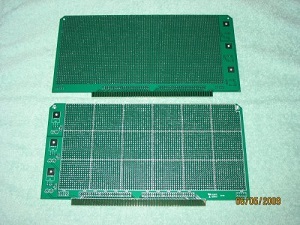 This board is a general purpose S-100 6502 CPU Board. It is built to be used with early IMSAI/Altair style S-100 Systems. compatible with and IBM-PC to run MS-DOS. 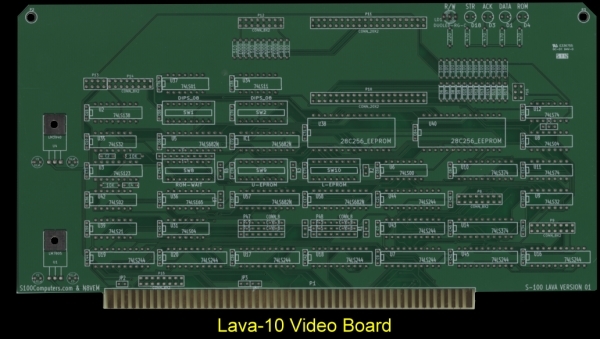 This board is a general purpose S-100 bus Video Board capable of VGA resolution. 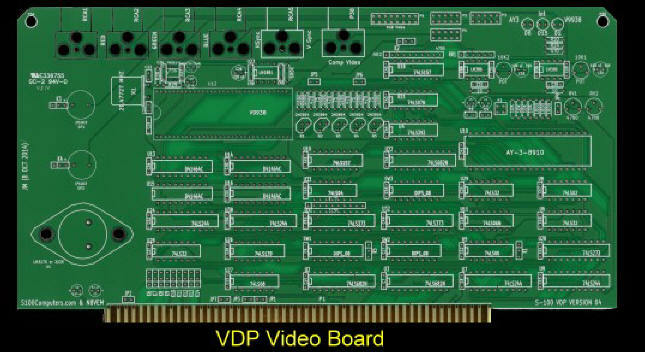 It can be used with other boards on the S-100 Bus to run Microsoft 's MS-DOS (or Digital Research CPM) for video output. 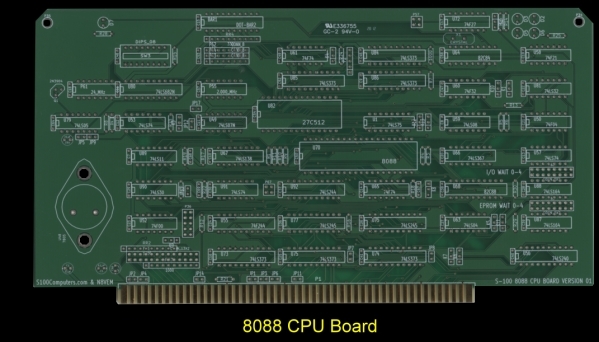 This board is the 8 bit equivalent of our 8086 CPU board (see above). 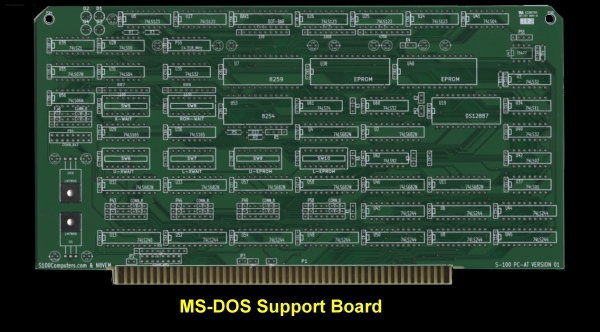 It can be utilizes with other boards on the S-100 Bus to run CPM86+ or Microsoft 's MS-DOS. 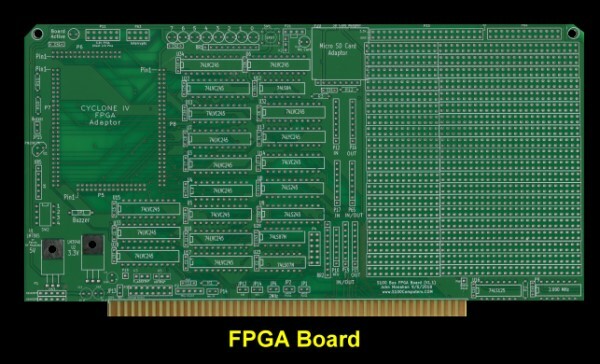 This board is driven by the Motorola 68000 (or 68010) CPU, a 16 bit CPU board. It can be configured as a bus master or slave. 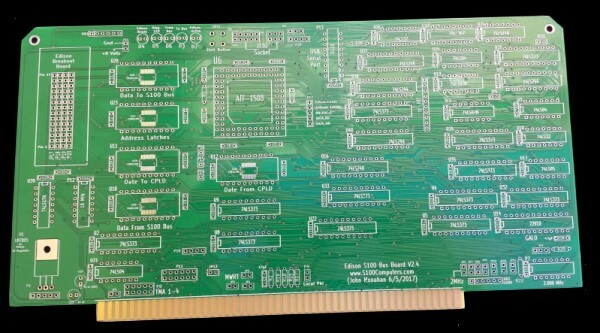 This board can be used to improve S-100 bus signals that do not have bus termination on the motherboard. 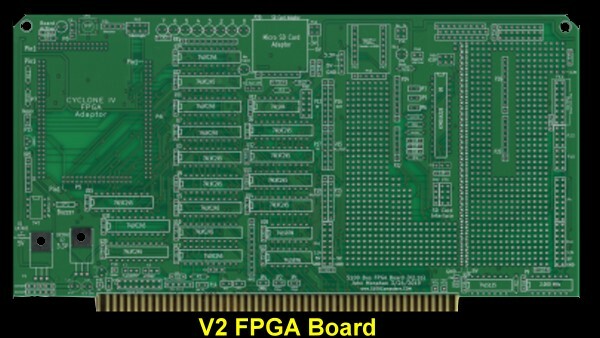 The remainder of the board can be used for general purposes prototyping. 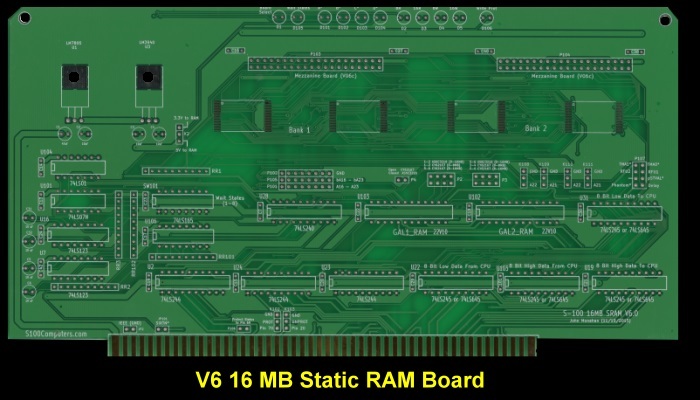 This board is driven by a Mostek 6502 CPU, an 8 bit CPU board. This board is a general purpose board for S-100 bus parallel IO ports. 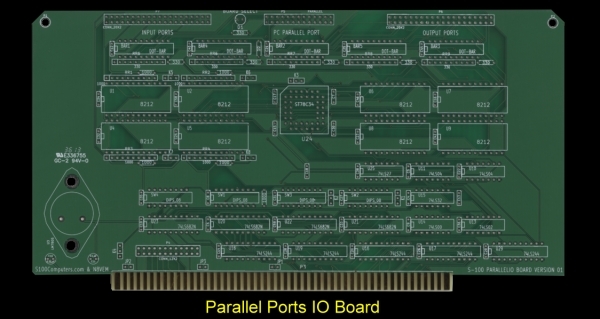 It also has an IBM PC-printer compatible parallel port. 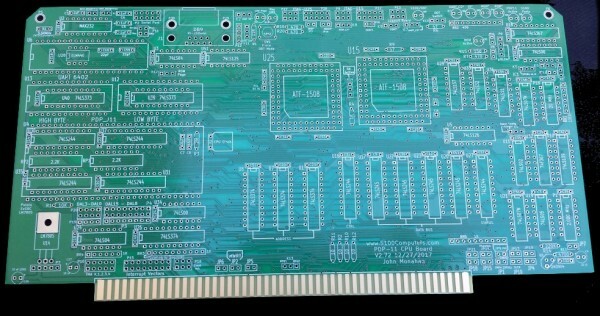 This board is a general purpose S-100 80286 CPU Board. 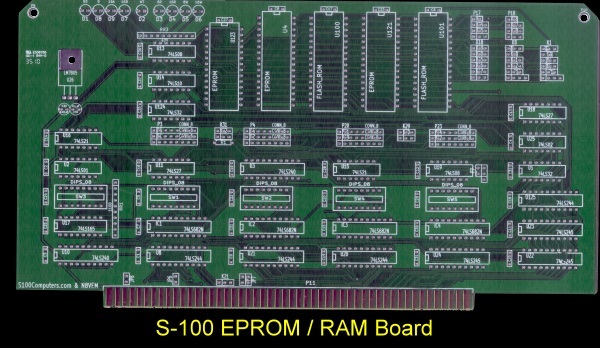 This board is a general purpose S-100 RAM and ROM Board. It is utilizes a wide range of Static or Flash RAM and EEPROM chips. 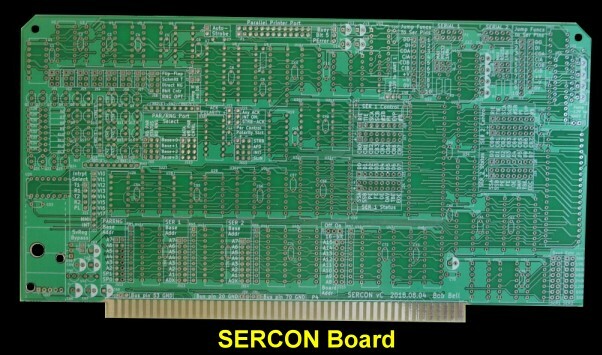 This board is a general purpose S-100 RAM Board. It is utilizes a 4M X 8 SMD RAM chips. 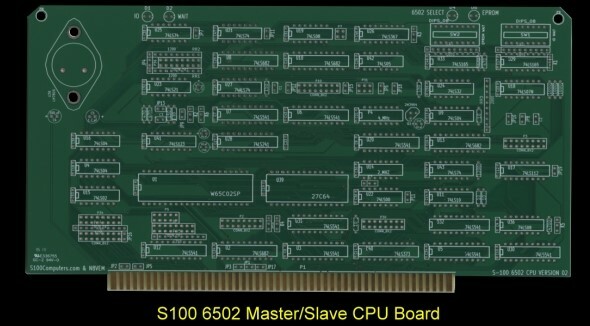 This board is a general purpose Master/Slave 80386 CPU Board. It is a first for the S100 bus! 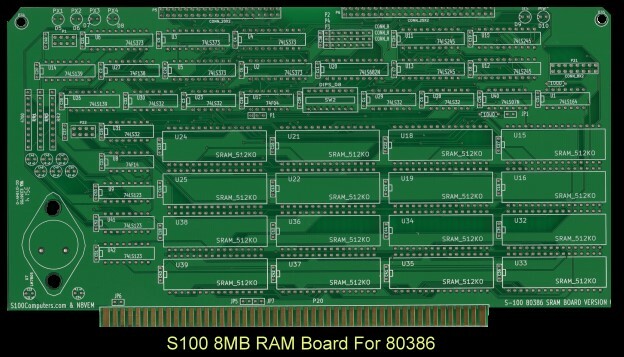 This is a special purpose S-100 RAM Board that connects directly to the above 80386 CPU board. 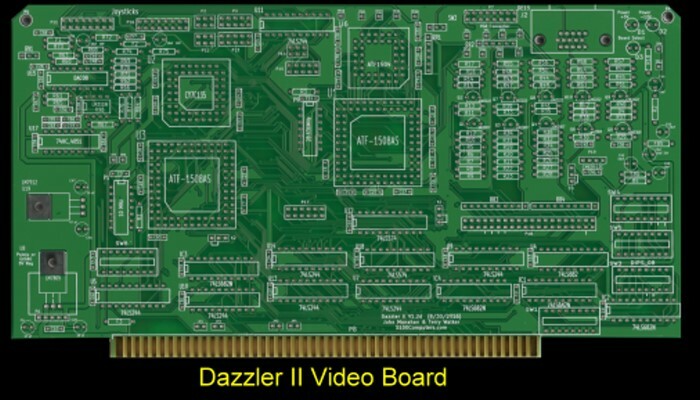 This is a MSX compatible video board. 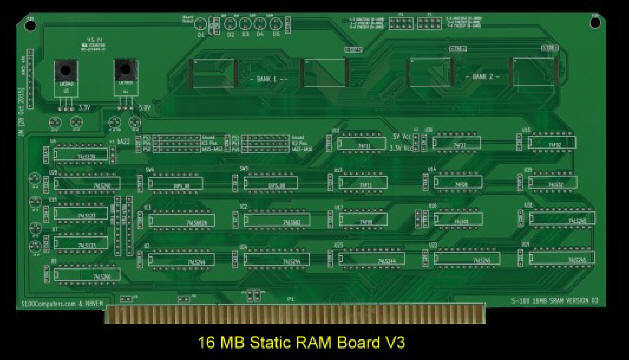 This is a 16 MB Static RAM board using SMD RAM chips. 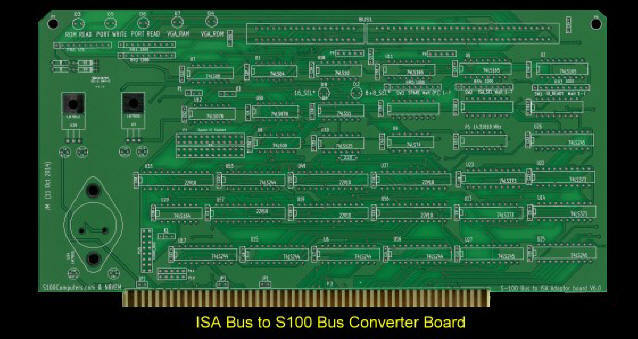 This board allows the testing of IBM PC-ISA bus boards in an S100 bus system. 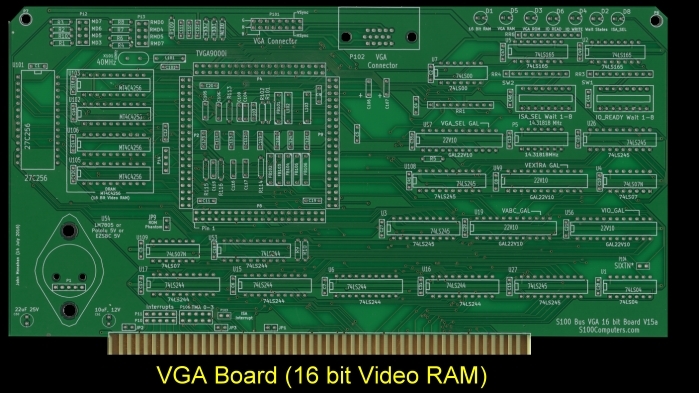 This board allows IBM-PC video graphics to be run with our S100 bus 8088 CPU board. 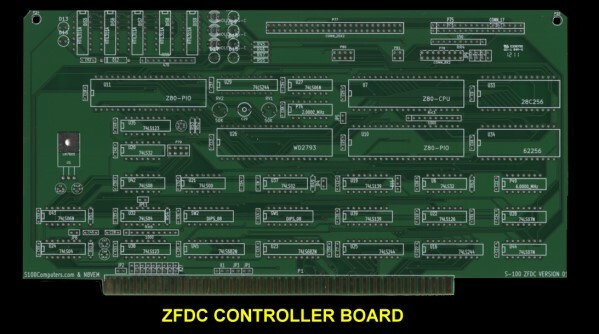 This board is a general purpose Z80 CPU board for beginners to get their system up and running. 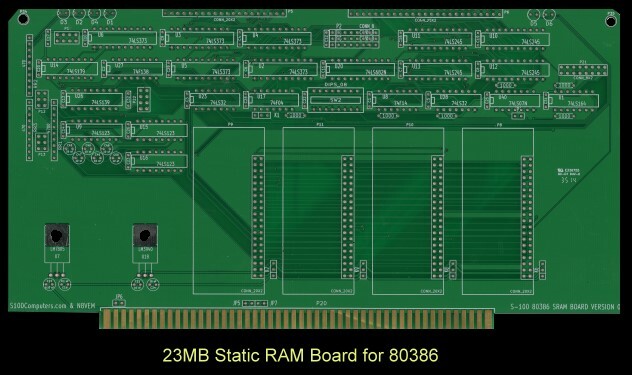 This is a specialized 32/64 MB Static RAM board for our 80386 and 80486 CPU Boards. 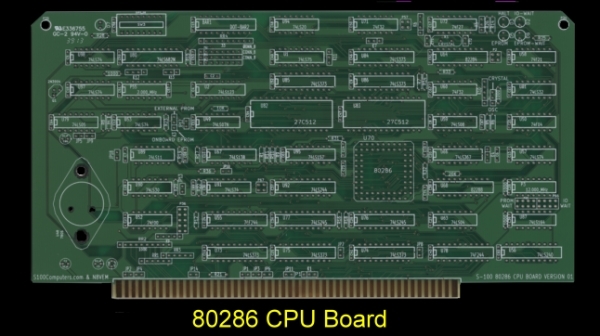 This is a CPLD based 80386 CPU Board. 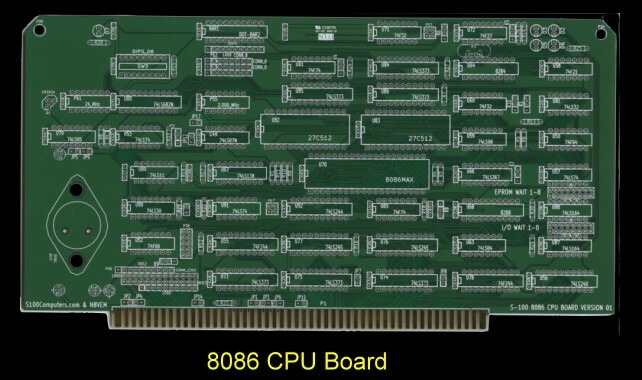 This is a CPLD based 80486 CPU Board. 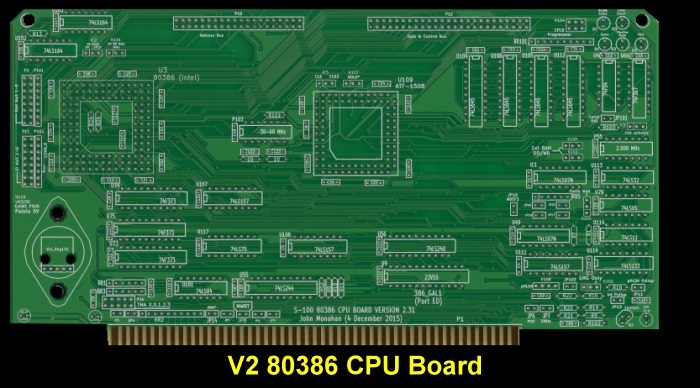 This is another CPLD based 80486 CPU Board. Please see here for more information about this board. 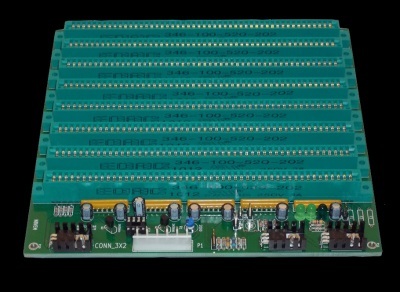 This is a four layer board. 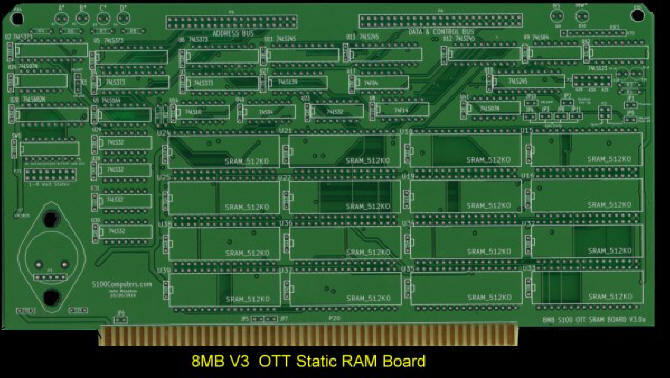 V3 OTT 32/64 MB Static RAM Board. 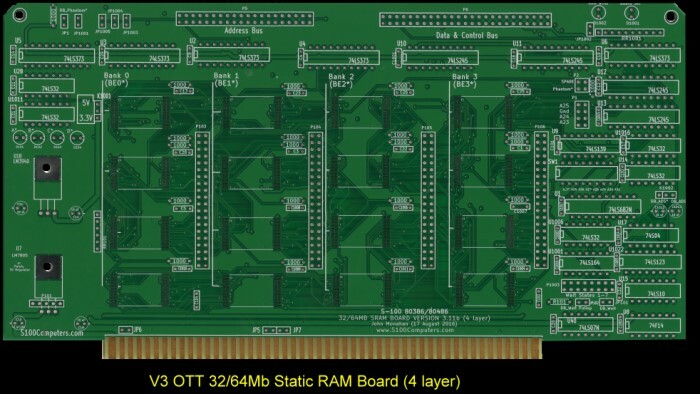 This is another OTT RAM board for the 80386 and 80486 CPU Boards. This is a four layer board. 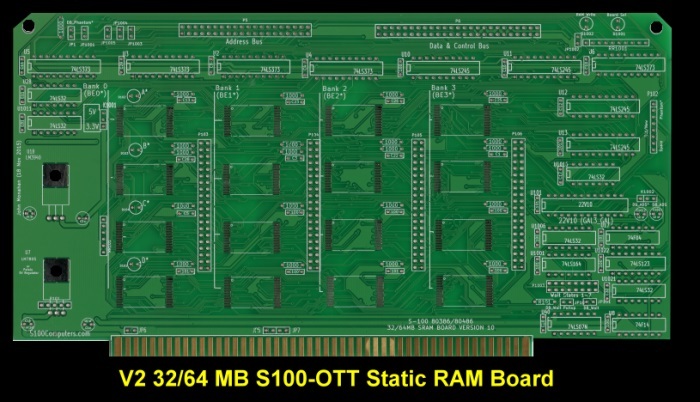 This is another OTT RAM board for our 80386 & 80486 CPU Boards. This is a 4 layer board. 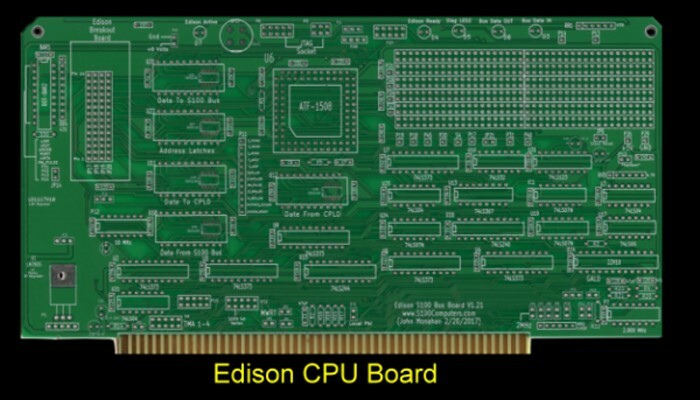 This board puts the Edison CPU on the S100 Bus. This more elaborate board also puts the Edison CPU on the S100 Bus. 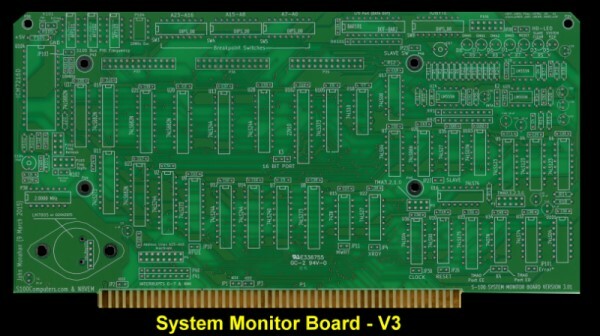 This is a diagnostic board for the S100 Bus. 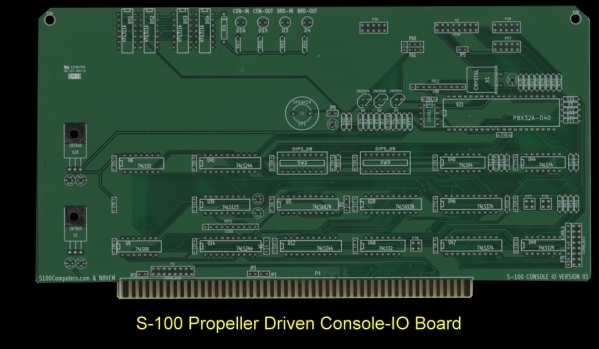 This very exciting board puts the Digital PDP J11 CPU on the S100 Bus. 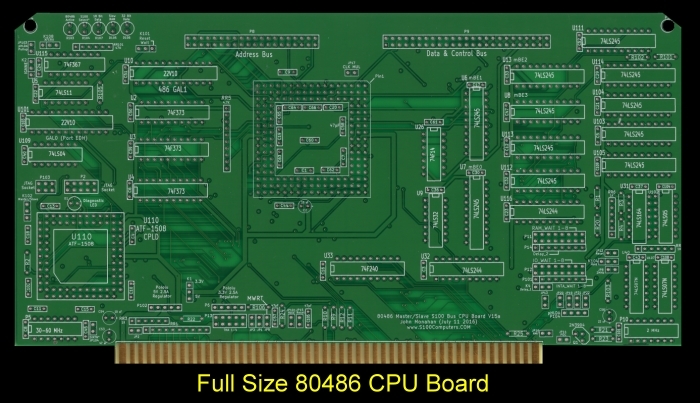 This board puts the Motorola 68030 CPU on the S100 Bus. This board puts the PDP11 CPU on the S100 Bus. 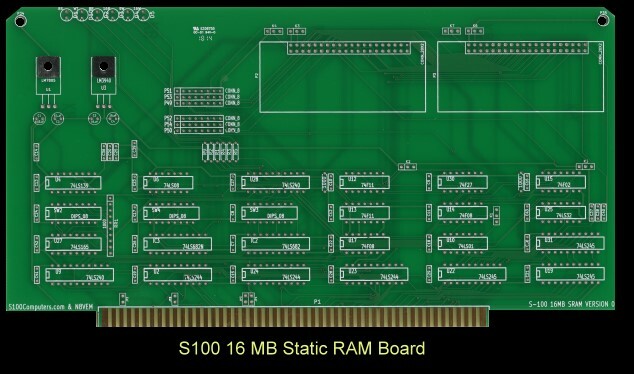 We have a growing list of S-100 boards planned. If you would like to advertise (for free) any new S-100 boards you have designed. Pease let me know. 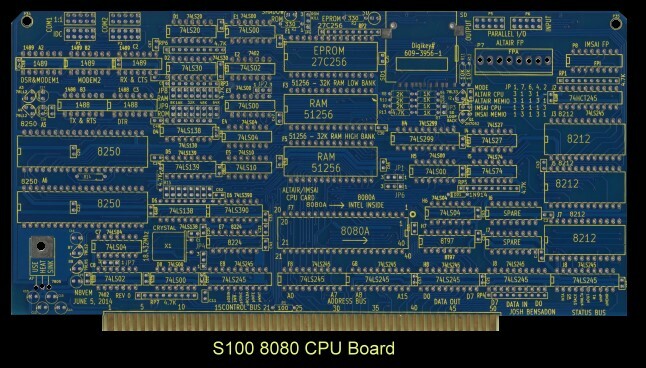 Josh Bensadon has made another new S-100 Prototype Board that is somewhat like the one described above. However this one cuts the number of basic support chips to a minimum thereby giving you more real estate on the board to work with. Josh Bensadon of Toronto Canada (aka Crusty OMO) has designed and fabricated an excellent 8080 CPU board with many extra capabilities. If you have specific questions or comments about the board and its related software you can contact him directly at crustyomo [AT] hotmail.com. 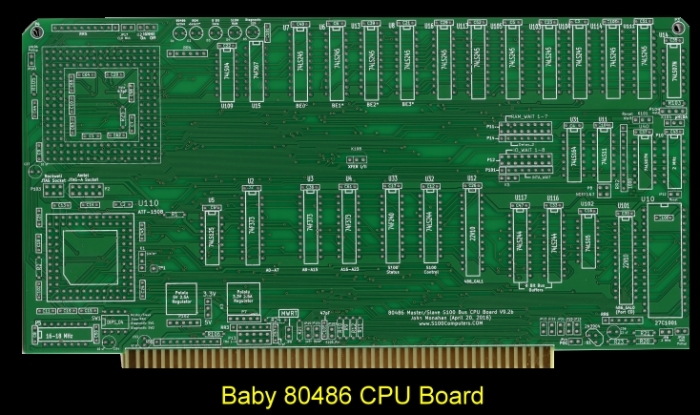 Don Caprio has designed and fabricated an excellent 8080 CPU board with many extra capabilities. If you have specific questions or comments about the board and its related software you can contact him directly at ilvunix [AT] gmail.com. Bob Bell of BCSTech LLC has designed and fabricated a front panel board with some excellent extra capabilities. If you have specific questions or comments about the board and its related software, please contact him directly. Bob is a regular contributor to the Google Groups S10Computers forum. 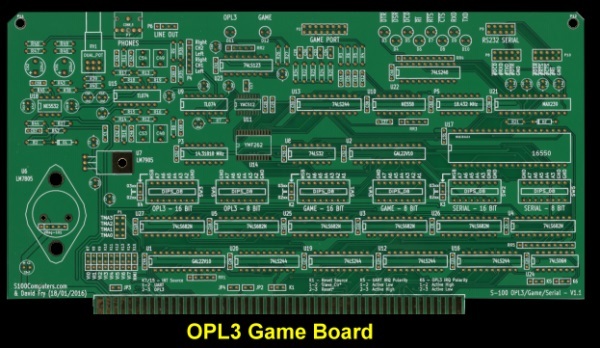 David Fry in the UK has designed and fabricated an excellent Games, Sound and Serial board. If you have specific questions or comments about the board and its related software, please contact him directly. Bob is a regular contributor to the Google Groups S10Computers forum. 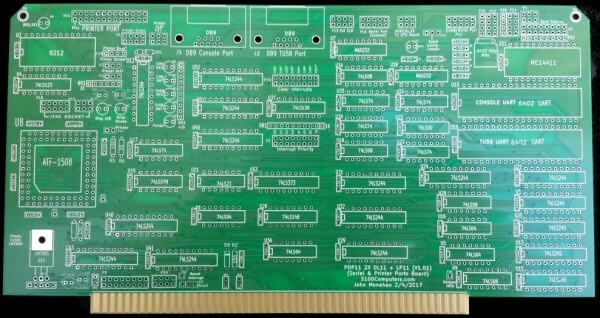 Bob Bell of BCSTech LLC has designed and fabricated this Serial I/O Board. The board has many features. If you have specific questions or comments about the board and its related software, please contact him directly. Bob is a regular contributor to the Google Groups S10Computers forum.